St. Martin's Griffin, 9781250000743, 368pp. In a small Colorado ski town called Sparkle, second chances come with the winter's fresh snow. Jill Anthony spent her youth in the ski town of Sparkle, Colorado, and more than a decade has passed since she left. When a devastating tragedy coupled with the worst kind of betrayal makes her want to do nothing but run away, the only place she knows to go is home: Sparkle. Lisa Carlucci looks in the mirror one morning and realizes that she no longer wants to treat her body like a Holiday Inn. She's going to hold out for love. The only problem is, love might come in the form of her ski bum best friend, who lives next door with his ski bum friends in a trailer known as "the Kennel." Cassie Jones, at age ten, has lost her mother and no longer believes in anything. Her only solace comes from the messages she believes her deceased mother is sending her through the heart-shaped rocks they once collected in the streams and hills of Sparkle. Three people at the crossroads of heartbreak and healing. Three lives that will be changed one winter in Sparkle, Colorado. 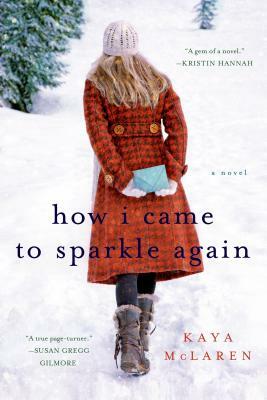 One tender, funny, tear-jerking novel you won't soon forget: How I Came to Sparkle Again by Kaya McLaren.